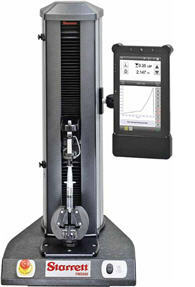 The Starrett FMS Series is a family of new and innovative force measurement systems. Available in four load capacities, these universal testing systems are ideal for general purpose force testing, demanding high-volume production testing, and exacting quality control testing. 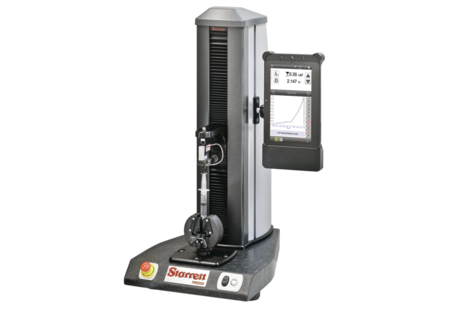 Starrett force measurement systems are your solution for tensile, compression, flexural, shear, coefficient of friction, and cyclic testing. You can easily and efficiently perform push/pull testing, break testing, constant hold testing or tests that must meet international testing standards from ASTM, ISO, BS, DIN and others. The FMS Series consist of a single-column electro-mechanical testing frame, combined with our L2 Series digital controller and a Starrett load cell sensor. Simplicity without compromise. This design objective is exemplified in our L2 digital controller. You can setup and perform tests quickly and confidently. Tests can be created in as few as two steps or you can create more sophisticated, multi-stage tests that comply with international testing standards from ASTM, ISO, DIN, BS and others. Touch targets, menus, lists of values and intelligent prompts guide you through your controller's operation. Test results are displayed in a large format for easy viewing. Results are displayed in tabular and graphical formats. Tolerances can be used to determine pass/fail results. You can eve view statistical analysis for your results. With the L2 software, you create your test graphically using icons that represent how you want your tester to operate. Icons for tension, compression, constant hold, cycling and more are used to create your test's operation. You can define limits, break conditions, pre- and post-test functions, and how you want results to be used. The software even supports communication to I/O devices so based on a result, you can send a signal to a device such as an annunciator. Supports a cariety of display languages including English, Spanish, Portuguese, French, German, Italian, Chinese, Korean and more.